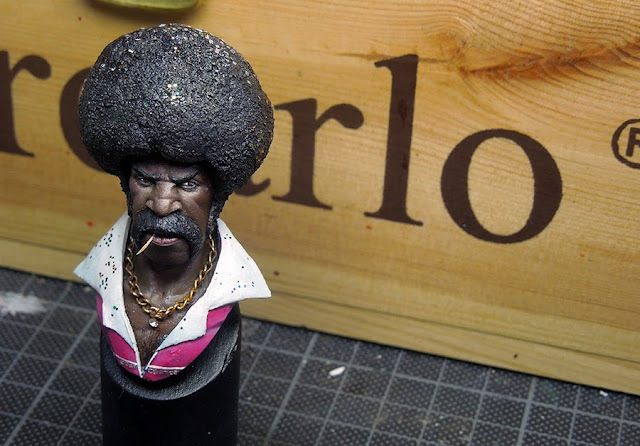 Last tutorial voting was a tie between "Funk" and "Carry Box". 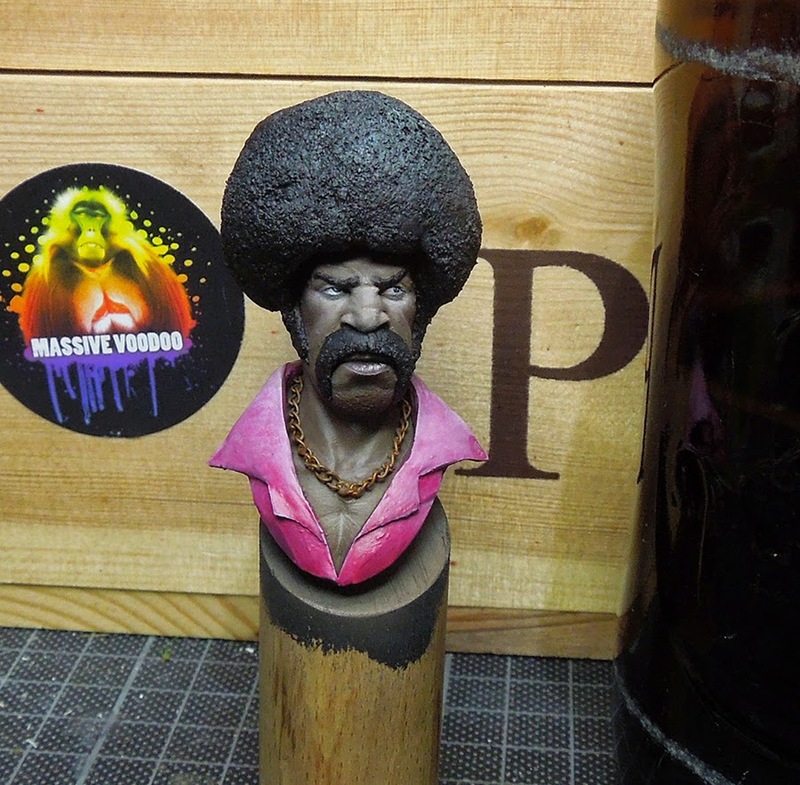 Massive Voodoo's year of the painter decided to bring you both this week. 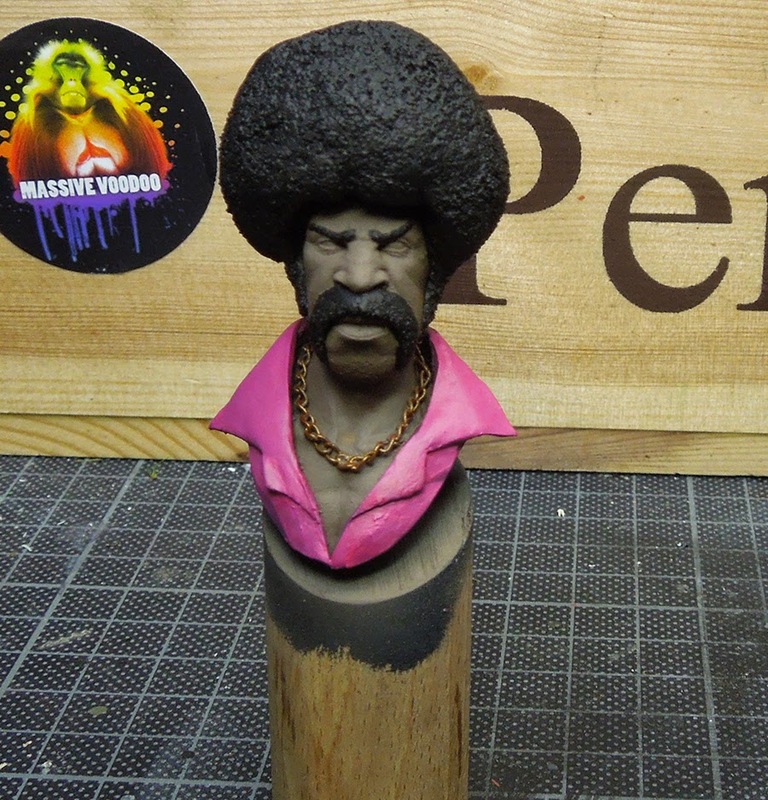 Let's find out what Roman has to tell on the conversion and the paintjob on "Funkmaster J". 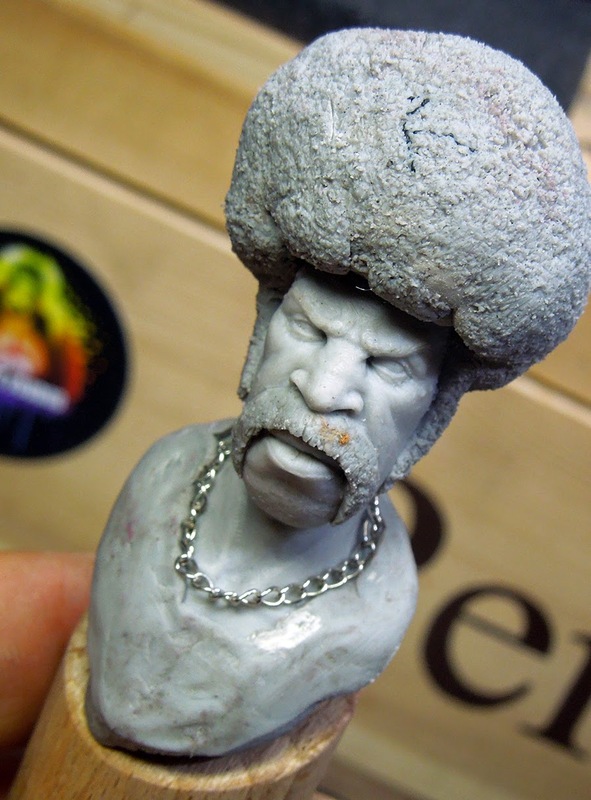 Well, I told you about the fun I had with the doing a conversion on Forged Monkey's Jamal bust, called Juva, 1883. 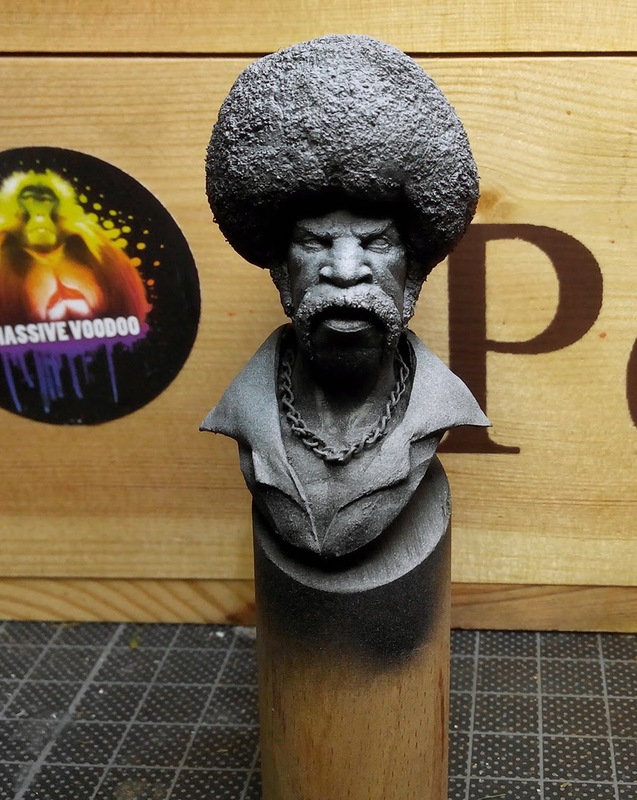 For me this bust is really an invitation do to a conversion on as it arrives rather simple but has so many possibilities for different visions. 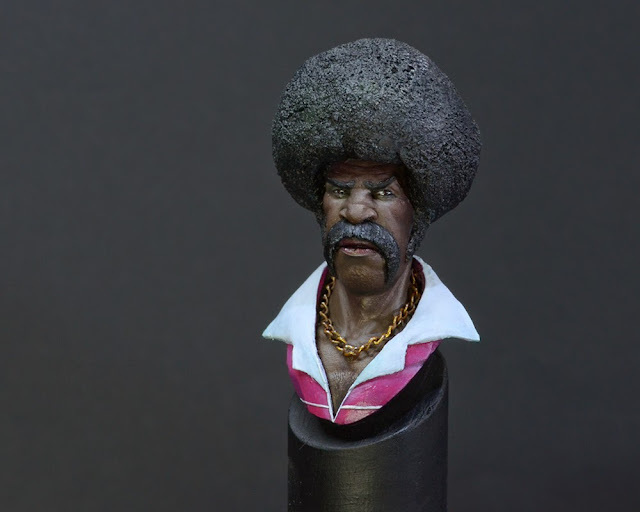 After I have learned a thing or two on how to start such a character conversion with the help of some putty and studied for myself how to paint dark/black skin - find the step by step about Juva here - I felt the need to do another one. 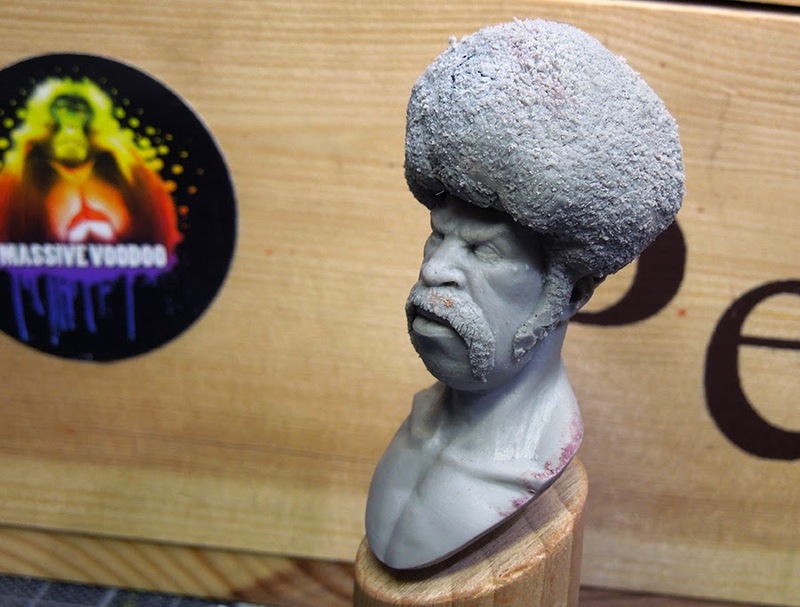 This article won't go as deep into the theory behind dark/black skin, nor will it go as deep into the conversion as the article about Juva, but it will bring you different aspects on the crazy steps that happened on Funkmaster J. 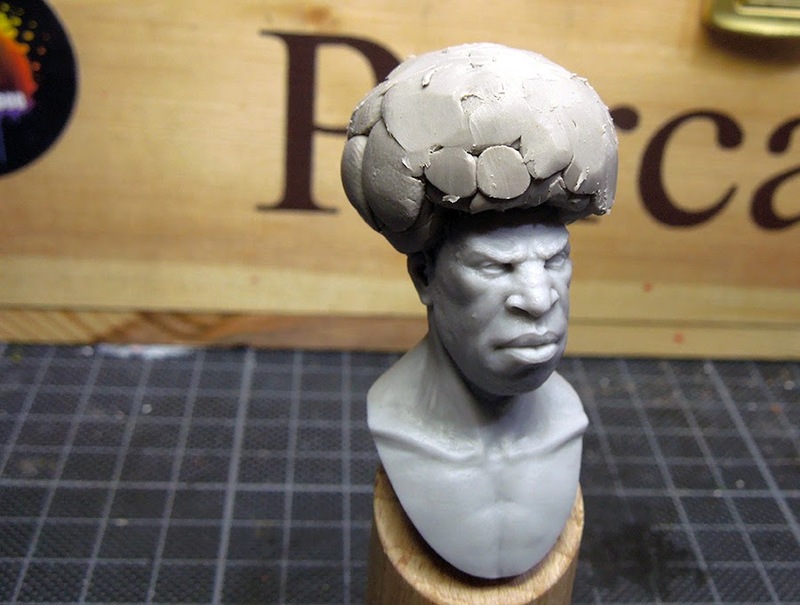 Start on the conversion was making his afro hair even bigger than the one I did on Juva. Therefor I again used BeesPutty plastic. 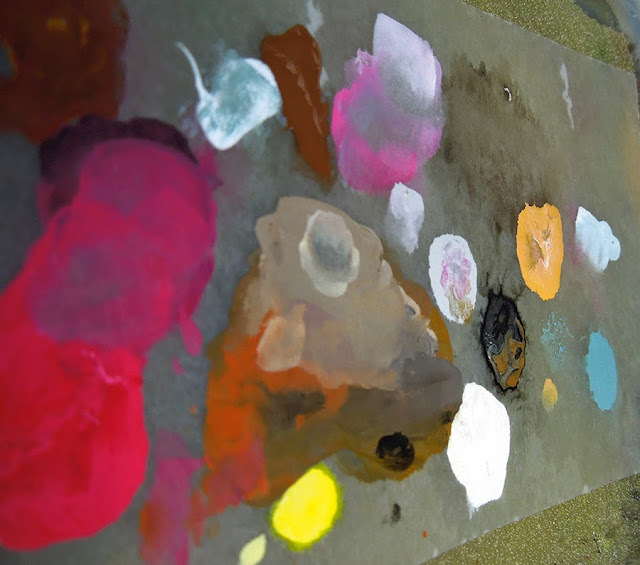 I started with basic volumes and placed them to get the initial shape. I baked this in the oven to have it hard for further work. I wanted it bigger and did more on top of it. When this was done I also placed putty for his funky beard and the Funkmaster's sideburns. Now - same procedure like on the conversion on Juva - I took foam and created the structure of his hair. Then I baked the putty again to have it all hard before taking on the next steps. 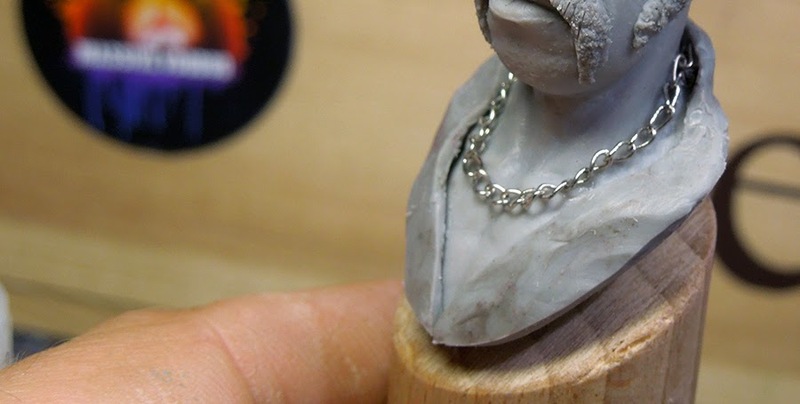 I put a metal chain around his neck and prepared the basic volumes for his 70's shirt. Made it soft with the use of spit and my fingers. Then cut out the shape of the bust again and did the same with a blade to the shirts shroud. Sadly I do not own a photo of the dog-collar work, but it was the same as before. Baking the shirt and then doing the two parts of the dog-collar where I tried to keep it some kind of symetrical. After this was done, I baked it in the oven again and primed the model black and white. 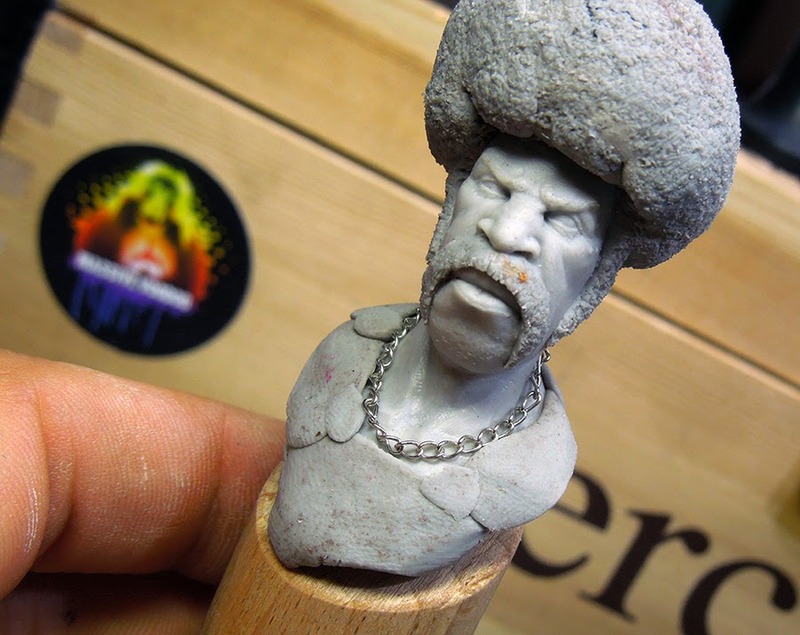 Starting the paintjob with applying the basic tones to every material. This gives me a good plan on how to proceed further on. Next steps was working on these basic colours. 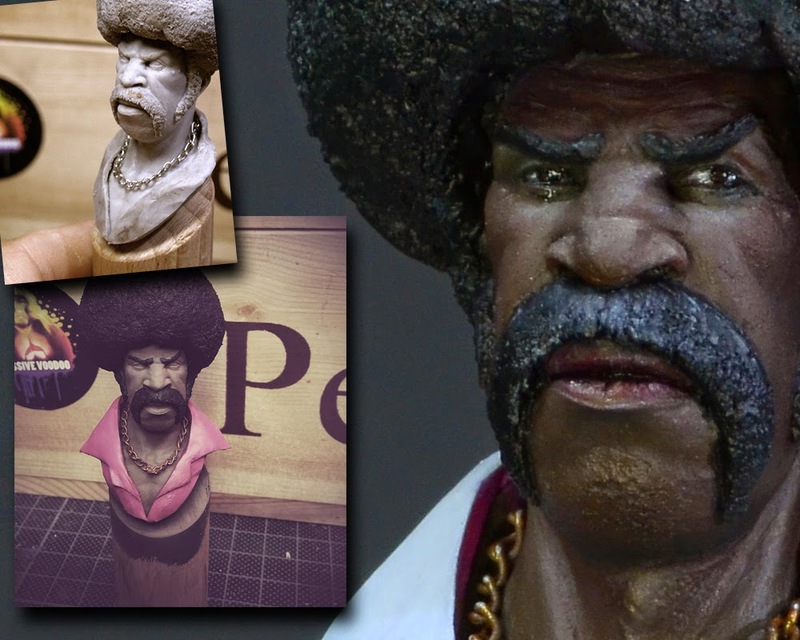 Adding highlights to the skin, drybrushing that hair, placing lights on the shirt and starting the eyes. At the moment the lights on the models skin all look kind of chalky. That comes from the highlighting process. I do not fear in this moment as I know that I want to put tons of coloured glazes on top of these lights to achieve the imense variety of dark/black skin. It will be softer later on, but first I need to see that contrast to find out where I am heading. Following you can see the colours I used for the skin and the shirt so far. 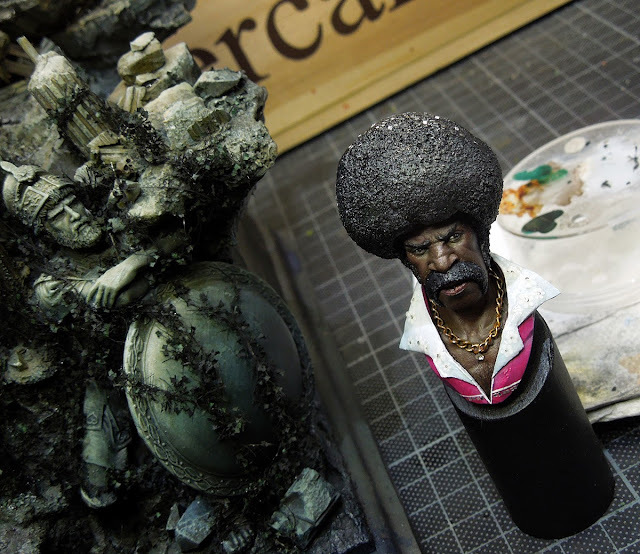 In the upper photo you can also spot the colours I used for glazing the skin. The dark brown, some redbrown mix and some orangebrown mix was glazed on top of my initial contrast paintwork on the skin. I did this several times and in between I decided to rework lights that I lost during this progress. I also used some thin purple and greenish glazes in that skin as this was what I have learned during the progress on Juva. The dog-collar was decided to go white to have a strong contrasting frame to his face. Actually this was where I called him finished back in those days and I took proper photos of him. 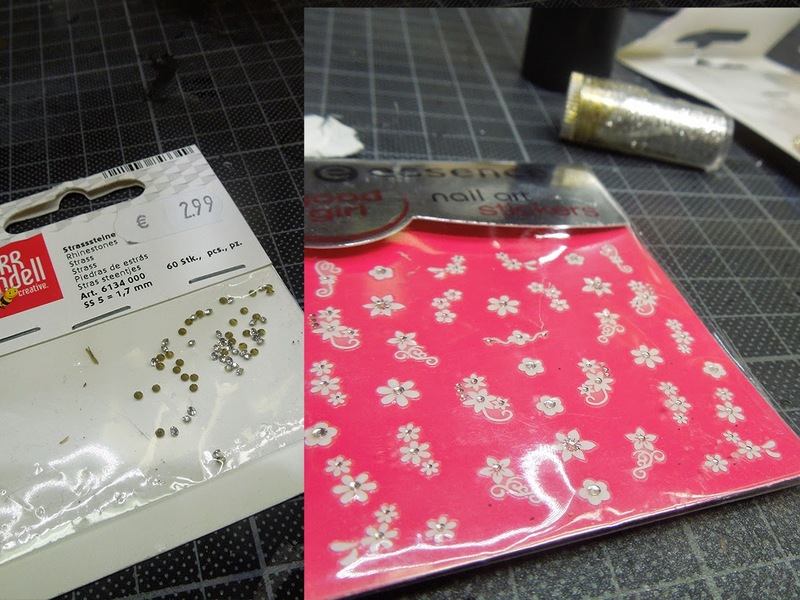 Well, some days after Raffa and Sanne came by with more glittering stuff they thought would fit to Funkmaster J. Raffa brought Rhinestones and Sanne surprised me with nail art stickers and glitter dust. As I am open for new experiments I thought to myself: Yes, I give that a try. I used one Rhinestone on his chain and placed the nail art stickers to his dog-collar. Put some glitter dust on his hair and really could see him heating up that funky disco fever. I was not very happy with how the stickers turned out. 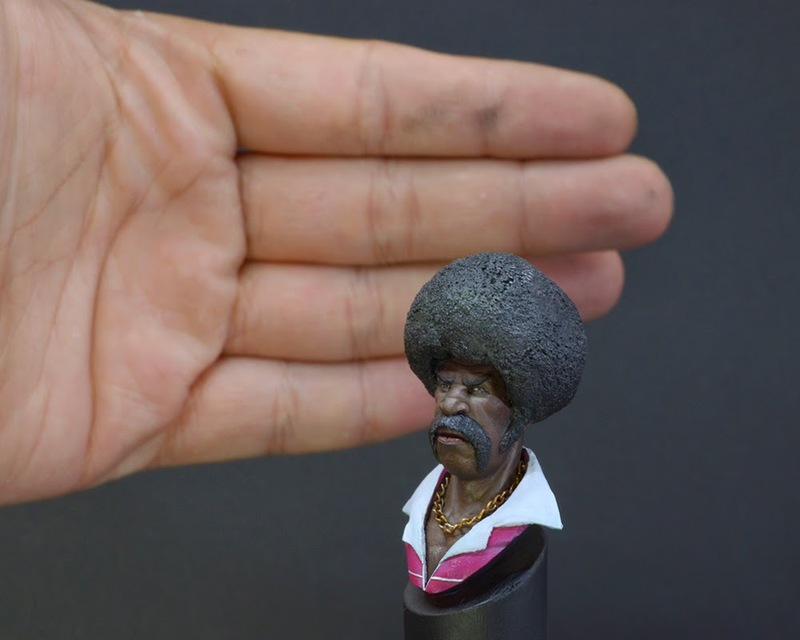 They might stick well to fingernails but not to painted miniature surfaces. After several tries to fix them with matt varnish and pigment fixer I removed them again and repainted the white. It just did not work and as they were so shiny it did not look good anymore. That was were I called him done for the second time. Last week, close to Monte San Savino Show I thought I give Funkmaster another look and clean up for the contest. I did increase a highlight here and there in his skin, but this was definatly not the biggest change I did. 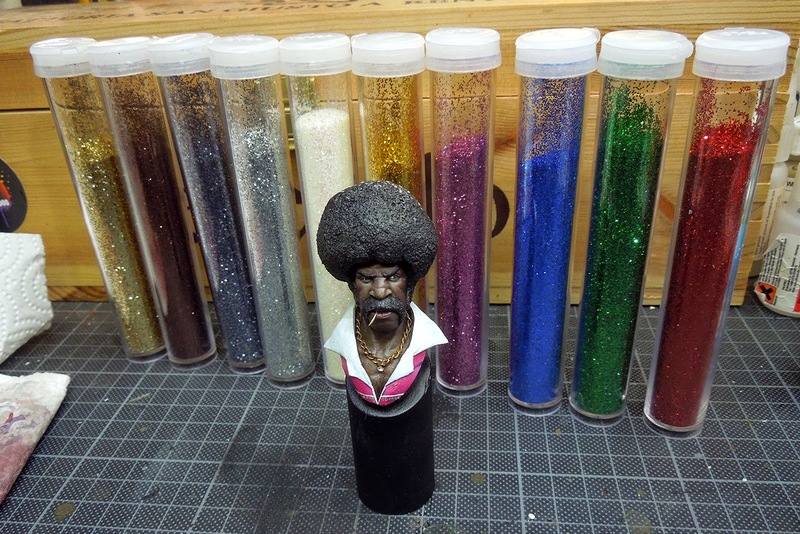 While Raffa and I were searching for some Halloween material some weeks ago we found mucho glitter in different colours and I was up to throw a healthy mix of it on top of this Disco legend. Placing The Shaolion Afronauts in the Jukebox the new glitter was placed with the help of matt varnish. 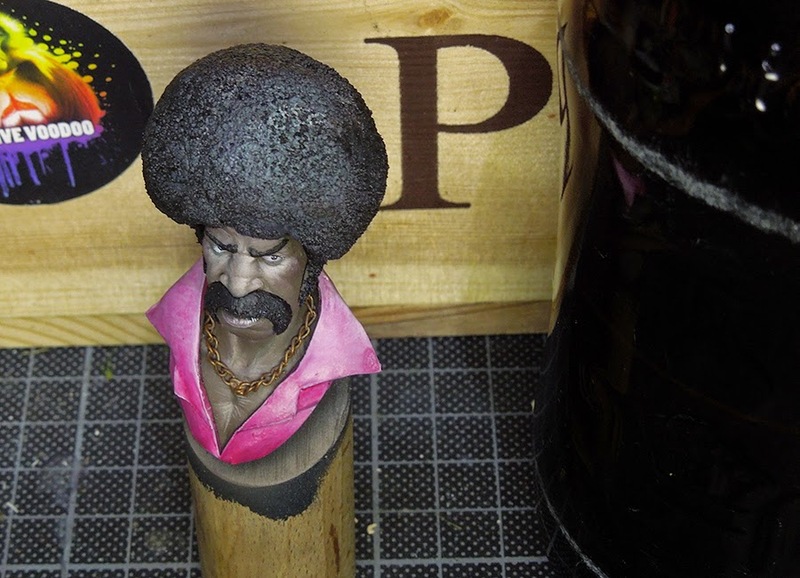 Oh wait, I also cut a real toothpick into tiny pieces and added a toothpick to his mouth. Now I called him finished for the third time. Let's see what I will do on him in the future - I hope not much more! Great funky tome with this dude. What was the baking température? How did You manage to bake the converted parts without melting the resin? The baking temperature was at 80° like explained on the BeesPutty explanation. For about 15 Minutes each. 80° do not melt Resin. Cool tutorial Massive Voodoo. Fun to see surprising material being used. Thank you. "with the use of spit and my fingers"
1. What was the base colour for the skin and hair? 2. 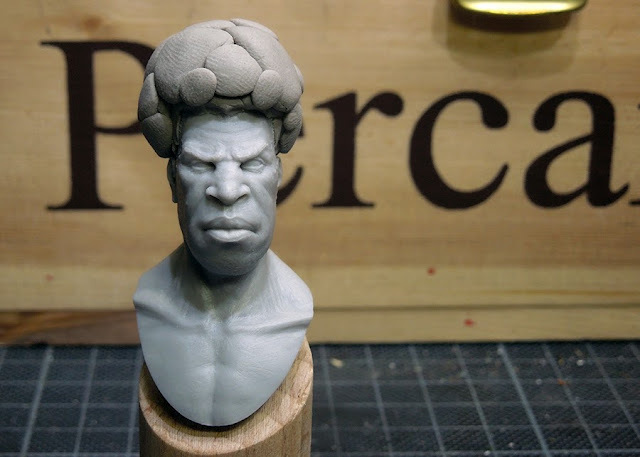 If I wanted to start sculpting miniatures what kind of putty would I be best using?